I have a server from Network Appliances that I mount on my Xubuntu 8.10 via SAMBA or CIFS. Mounting a share from that server is ok, but when changing to a directory below that mountpoint, the system quickly crashes. The directory in which one I change has some 250 directory entries. In the few cases, where the system doesn't crash and where I can do an "ls", the result only shows some 145 of the 250 directories. As I told, the system normally freezes. It does this nearly every time when entering "cd" followed by TAB (for bash completion). In that case, nothing works any longer, not the mouse nor the keyboard. The system can even not be pinged any longer. There's no problem mounting a Samba share on a Linux server; the bug only occurs when mounting a NetApp share. I made my tests on 4 different PCs with the same results everywhere. I saw a similar bug report with the number 296304. Although the server there is a Wind98 oldtimer, the effects seem to be the same. Thank you for taking the time to report this bug and helping to make Ubuntu better. This bug did not have a package associated with it, which is important for ensuring that it gets looked at by the proper developers. You can learn more about finding the right package at https://wiki.ubuntu.com/Bugs/FindRightPackage . I have classified this bug as a bug in samba. I'm having this same issue myself. Edited /etc/fstab to mount two shares off a NetApp. System completely locks up and I have to turn the system off. If I use the GUI to mount them, they mount, but when I try and open a file/directory, again the system completely locks up. (Ubuntu 8.10, 32bit, with all available updates) and a NetApp share. The first ls showed only 148 of the available 288 files in a directory. After some more ls (or cp) the kernel crashed. I don't believe this is a bug of samba. When using smbclient directly this effect does not apply, i.e. no crashes or missing directory entries. Also no problem with Ruby/SMB (http://rubysmb.sourceforge.net/) for example. Is there anything between "ls" and samba? I can confirm this issue with 8.10, and I can reproduce. The system will freeze after mounting at any time, lasting from immediately to several hours, where 1 minute or so is most common. Keyboard LEDs usually start blinking. I'm not a kernel dev, but how possibly can a bug like this take out the entire system? Sounds like two bugs to me: On in this package (BTW is this a module?) and one in the kernel. I just confirmed with our admins that Iæm mounting a against a NetApp server. Might be a dupe of bug 286828. Could you test the kernel in intrepid-proposed together with the "nodfs" mount parameter as explained there ? I just tested with the new kernel from intrepid-proposed, it indeed works with it with and without "nodfs". I can't ssh into the box, if I have an active connection via ssh, it kills it. I added the nodfs mount option in fs/cifs/connect.c in my intrepid kernel (2.6.27-2), recompiled the kernel, installed it and restarted. I mounted the NetApp share with that option. The bug still persisted (system freeze). So, that's no solution. I then tried intrepid-proposed (kernel 2.6.27-11) and can confirm that the bug has gone. It works with and without the nodfs mount option. So it's a different problem, but some other fix in 2.6.27-11 fixed it. (before only 149) and no crash anymore. Whoopie! But I can't find anything related in the kernel changelogs. Does anybody have an idea which change did the trick? Does anybody know if there's an archive of the debian packages of these kernel versions somewhere? If so, I could try the different kernels one by another in order to find out when it started working. That way, we could reduce to a minimum the number of changes that might have an influence. 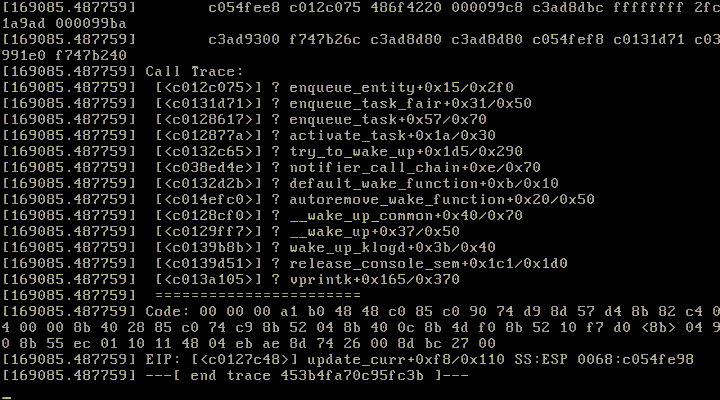 Does anyone know if this is fixed in the kernel in jaunty? I don't have access to a NetApp to test against. I upgraded a box to the latest 9.04 over the weekend. I should be able to take it to work and verify if it is/isn't fixed in 9.04. Now if I just go to 'Places' 'Connect to Server' and connect to the shares that way. It works. I'm able to browse the share, open documents, files, whatever else...even write to them. Never crashed once, unlike the old 8.10 that would crash almost instantly. I'd say it is fixed in 9.04. I can also confirm that I too can mount and browse large cifs shares (i.e. with 144+ files and directories) on a netapp san with the new kernel update.